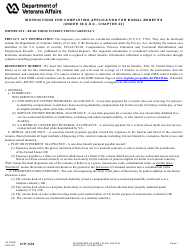 What Is Va Forms 21p-530 Series? 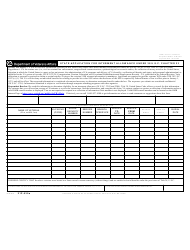 VA Form 21P-530a, State Application for Interment Allowance under 38 U.S.C. Chapter 23. The forms from the VA Form 21P-530 series replace the VA Form 21-530, Application for Burial Benefits, which is no longer in use. The Department of Veterans Affairs (VA) Burial Allowance is a one-time benefit payment payable toward the expenses of the funeral and burial of the veteran's remains. Burial includes all legal methods of disposing of the veteran's remains including, but not limited to, cremation, burial at sea, and medical school donation. En route while traveling under prior authorization of VA for the purpose of examination, treatment or care. VA Form 21P-530 is necessary to apply for the VA Burial Allowance. This form can be filed by the veteran’s surviving spouse, their children or parents, the executor or administrator of the estate or the survivor of a legal union with the veteran. Payable to a State if the veteran died from non-service-connected causes and was buried in a State-owned cemetery or section used solely for the remains of persons eligible for burial in a State Cemetery. A state official completes VA Form 21P-530a to apply for a State Interment Allowance, using the data provided by the veteran’s surviving spouse, children, parents, executor or administrator of the estate, a survivor of a legal union with the veteran, or the recipient organization, or provided by the applicant who completed VA Form 21P-530. VA Form 21P-530a contains a list of individuals, buried in a State Veterans’ cemetery, their identification data, and the information about their period of service. The VA uses the data form this form to determine the eligibility of the state for the interment allowances. Without this information, the VA would be unable to properly determine eligibility and pay benefits due to a state.